Click Here: https://www.ampmpodcast.com/mastermind and Register Your Spot in the Webinar! In this podcast, Manny Coats talks with Kevin King and discusses Amazon Private label ninja stuff. When did and for how long Kevin King been selling in Amazon? Kevin King shares his experience being a private label seller. Kevin King shares some strategies when selling in Amazon. Kevin King shares some tips in launching new products. How does PPC affect my organic ranking? Manny and Kevin talks about PPC strategies. 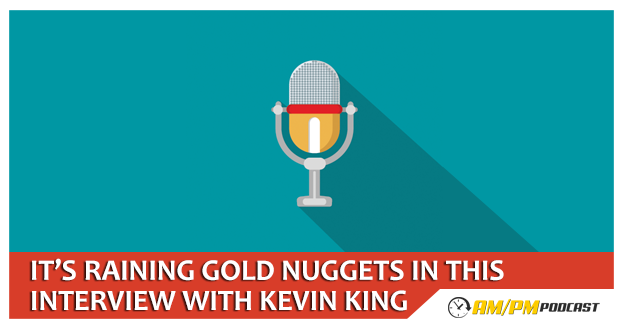 Kevin King shares his strategies when it comes to keywords. How do I benefit from translating my product titles? Kevin and Manny talks about “brands”. How many units should I start with my product? Kevin shares on how to deal with Chinese suppliers. Kevin and Manny talks about product packaging. How does packaging affect product sales? What images should I put for my product? Manny and Kevin talks about product pricing. How should I set my product price? 00:39 MANNY: I’m here with Kevin King and he’s always doing ninja stuff. We will be discussing how to generate recurring revenue 24 hours per day during the AM and the PM. I was watching a Quentin Tarantino film of about three hours long, I was making money, how cool is that?! I did the amazing interview with Kevin King and although the quality of the audio isn’t of the best, it is worth listening to every minute. You’re pretty successful with Amazon FBA. If you don’t mind me asking, how much are you doing in sales per month at the moment? 01:55 KEVIN: Right now we’re doing low six figures per month, and growing. 01:57 MANNY: Wow. How did you get into Amazon FBA? 02:08 KEVIN: I’ve been dealing with Amazon for years. I’m one of those guys who has an old school account – I can get the daily withdrawals; I don’t have to wait. I buy tens of dollars of stuff for myself and my business through Amazon, I’m a big customer. If I see something in the house which I want to sell, I put it up on Amazon. I’ve been dealing with Amazon for 15 years in another business of mine called Amazon Advantage which is a principle for media, books, DVD’s etc. where they actually issue purchase orders and you send your stuff in on consignment and they pay you. I’ve had a business account for 20 years so we wholesale to them on that side – It’s a little bit different to the FBA. Two or three years ago I stumbled into something online where people were doing this FBA thing – didn’t get right into it at that moment as I was busy with other business (I can kick myself today!). I started with FBA about a year ago. I had a buddy – we did a little bit of retail arbitrage just to get my feet wet a get to know the system, how Amazon ships things and how they work. I quickly realized that the work was too much in relation to the return. My buddy was a bit more enthusiastic and started with it right away. I was in the developing business for years – I saw the FBA business last year May and read up on it, listened to podcasts – I was all in. I got my first product launched at the end of July. I have 7 products right now on Amazon. I don’t count the first to as they were a test run. 06:02 MANNY: It seems like there’s a common theme with the successful people, the ones who are doing really well and that is that the first products initially just fail, they don’t do very well. It happened to me too, I just didn’t do my research well. The one product is not there anymore and the other is just not doing well. 06:28 KEVIN: I have two in the beauty category that are just like that. I followed the formula that most of the podcasters teach – many people go with this formula so when I chose the product in May last year so unfortunately there were about seven guys that had the same product. By the time I got it launched, there were about 100 of them. The product was a serum and there’s no differentiation – I tried to make the packaging different but a serum is a serum. I quickly learned to not play whatever everyone else is playing. I then chose a product that is whole different then the first two – a category newbies wouldn’t choose and I’ve been doing good ever since. They’re still a standard sixe product on Amazon but in an area where not a lot of people want to mess with. 08:13 MANNY: Are you saying that they don’t want to mess with it as the price point per unit are just higher? 08:18 KEVIN: You are still paying a buck or two to get your product and selling it for $15 and to bring it over – instead of paying a small amount for DHL or whatever service you’re using, I’m paying airfreight so it is costing me more and taking longer to come in. They’re still the standard size so you don’t pay extra to get the products in. 09:18 MANNY: I always say like a basketball player’s shoe box. I’ve been doing the same for a while and some people will come back and say that I’ve said something else in a podcast but times change, things change and you’ve got to change your strategies. Lately I’ve also been telling people to stay away from the cheap stuff. It’s hard to get the right margins for Pay Per Click. If you have something that you can sell for $30 or $40, that would be great. You’ve then got a bigger chance at success. 10:09 KEVIN: The best cost product I’ve bought was $20. I’ve sold it for $79. If I sell anything, I try to triple the cost to cover shipping cost etc. if I don’t come close to triple my cost, then I’m not interested in selling the product. A lot of people do not have the finances to start something like this up – those who are asking what they need to start it up are most probably looking to just get rich, something like a lottery ticket. Most of those people have given up and started something else. 11:11 MANNY: If you start up with just $200/500, you can’t get into the products that were mentioned. You can’t buy a $10 or $15 product with $200. 11:31 KEVIN: A lot of people only want to do this as an alternative to their regular job – to pay credit card debt, to go on vacation and that is all good. If you want to make a living out of this only, you’ve got to put some money in. I’ve invested quite a lot because one of my strategies is not to just go out and find something out of the global sources, bring it in and sell it on Amazon – half of my private label products, I develop from scratch. I’ve hired people on Upwork who made sketches for me and did all the CAD designs and another guy who alternate the sketches to see from different angles so it looks like a real product. I then do 3D printing so I can test the product out and make sure it is correct/give it to someone to test it out. I only then put the product out there. I go look at all the negative reviews and where there is a gap in the market – if someone sells the product for $10, I sell it for $40 to cover the high end of the market. My sales may be less and my BSR lower, but I’m making more money. All my products right now are between 3000 and 7000 BSR. I’ve got products making me $500 profit a day which is 7000 BSR which is after expenses, advertising costs, sponsored ads, everything. That is one of my strategies, to create these custom products and the major advantage to this is you can have higher margins and zero competition. If you search for one of my products, there are 1000 hits but 800 of those are all the same product with no differentiation. One of my products in the Sports category is not custom but I differentiated it by adding 3 other components and it’s the most expensive in its category. I also do custom packaging on all my products. There’s two reasons for that: I’ve shown my packaging in one of my listings which I’ve never had a problem with, with hi-jackers – another reason is that I look at these products for long-term retail. Amazon is a great platform to launch in, to prove you have a good product and to get feedback from customers, improve the product and then take it to retail in the big stores not only to make money but to lavage yourself to if something ever changes on Amazon, if you lose your account for some reason, you’re not just out there flapping in the wind. 16:07 MANNY: This is a lot of good information. You’re on pace to do seven figures this year. You’ve made over a million backs. 16:31 KEVIN: With the holiday season, based on last season and what I could’ve done if I was prepared during December and January, I expected this year to do $2,5M to $3M this year. I’m launching a few new products now and if I get a single or double, at least ten a day, with a $15 margin on each product, that’d be good. If I launch a new product, I’m willing to spend some money to get it going. I’m going to get reviews. Reach for the top 10 000 reviewers and find the ones that list things they love in their bio – get 10 of 15 of them and give them the product – offer the amount to them, give it to them for free and have them order it through Amazon so it go through the system. That’s a good way to get started and then use services like review check to get your reviews up to around 15 or 20. Some people say you need to wait to do Pay Per Click until you get a certain number of reviews, you don’t need to. Five reviews will be sufficient. You need to turn on pay Per Clicks and start making money instantly. The best investment is through Pay Per Click as you can buy your way to the top. I you buy a product for $20 and you sell it for $79, after all the commissions and fees, you can still afford to pay $10 per click/sale average. The way I look at my sales is: I take the product and say I’m going to spend $10 on marketing. If I sell 10 per day, it’s going to cost me $100 per day to sell those products on Amazon. If four of them were sold through sponsored ads, I’m acquiring them in my personal figures – I still calculate them as ‘losing the money’, I’m willing to break even now in a competitive space. I launched a product in December and I was spending about $600 a day to get that product launched. I was still making money and it still sells the same amount each day, I’m only paying $40 per day in advertising so if I have to initially not make money because of advertising, that’s fine. With Pay Per Click you build up the recognition for your product, unlike with the normal reviews. 22:50 MANNY: Pay Per Click will increase your organics, I say that too, but a lot of people say that Pay per Click does not affect your organics. You believe that too? 23:15 KEVIN: I believe 100 percent that it does increase your organics. Why wouldn’t it? Amazon is all about selling products. If they know that you are selling a product and it gets lot of searches, why wouldn’t they show it organically to you? You’re buying space through Amazon with Pay Per Click just as you would buy shelf space in a grocery store. You’re doing the same thing on Amazon through sponsored ads and proving yourself. 24:52 MANNY: Do you feel like there’s a difference between having that top spot at the top of all the searches vs being on the side panel or different positions for Pay per Click? 25:01 KEVIN: I think the most important thing is to be on page one. If you look at studies, only 30% of people go past page one. Most people will scroll through the first page and see what’s there. Best position is to be on the top left position. 25:49 MANNY: For those of you who are starting out – if you start out, you’re not going to be on page one initially. You’re probably going to be on page 17. If you can get a few reviews and start Pay Per Click, you can be on page one within a few hours. There’s very few industries where you can get in and get that immediately from page access. You might not be making money initially; you’re trying to buy op your organic ranking. The first month is almost a throw-way to build up your position. 27:02 KEVIN: I’ll let my Pay Per Click run for about seven days before I make any major adjustments. As long as I’m in that top two spots initially, I’m fine. If the keywords doesn’t look good, I’ll lower my bid and give it a week before adjustment. 28:23 MANNY: If you’re adjusting the bids on that keyword, are you saying that you’re initially running an automatic campaign and then you’re moving to a manual and then you’re adjusting them specifically manual? 28:38 KEVIN: I initially run an automatic campaign to see if Amazon thinks the product is what I think it is. At the same time, I also run a manual broad to pick up on other things. After a week I’ll eliminate the automatic, I’ll then see what’s working and what’s not working. Once I settle on keywords, I’ll move to a phrase or exact and see what works best. 29:46 MANNY: if you’ve got a small subset, 15 keywords or phrases that are awesome, you’ve eliminated all your automatic campaigns and you’re now on manual, are you setting up different campaigns for each keyword so you can control the individually? 30:00 KEVIN: No, I just put them online with a $500 budget daily. 30:08 MANNY: And then you just control the bids by going in there and checking the keyword phrases. 30:13 KEVIN: Yes. I’ve done them automatically, I’ve tested it where I just lower the bids so I get $1 for Pay Per Click to see if I can get someone that goes to page six and sees my product. I wouldn’t recommend continuing that. 30:46 MANNY: So if you’ve got these 15 awesome keyword phrases set up in your manual campaign, do you still find it’s worth it to have 5000 characters’ worth of other keywords if you’re not pushing those through Pay Per Click or is that still super important for the organic side of stuff? 31:08 KEVIN: Amazon has changed and it only allows you to have 5000 characters and it’s not keywords. I take a different approach on that, on a lot of what people and Amazon says is a lie. In my first line I repeat all my main keywords even though they’re in my title or wherever for in case they change the algorithm. In the next few points I fill in with a lot of random words, unique words that are not in my description or bullets or title. Those are just casting a wide net. For example, if I have a dog product in there, I will search for the top dog breeds and I’ll put those in there because if someone is looking for a dog product, they might type in “dog food” and you’ll appear for that. In the last line I will put in Spanish translation of my keywords as there’s a lot of people that do not speak English in the United States and has the second highest population of Spanish people. 35:09 MANNY: That’s awesome information. You basically resurrected a failing product. 35:16 KEVIN: Once I did that for the first product, I went and did it for all my other products. The products are in different categories so it won’t work for every product necessarily, it didn’t work as well for all my other products. 35:49 MANNY: Awesome! How do you deal with misspellings? 35:53 KEVIN: I use the extra space in the last bullet to deal with that and Amazon will autocorrect that too and you’ll land up in more products with the misspellings. 36:35 MANNY: I’ve noticed that too. If you have that keyword on there, it would show in your search and ask “Did you search for this?”. I am actually for a number of highly misspelled keyword phrases. 36:57 KEVIN: With the Spanish and the serum product I had – if you type it in, thousands of products show up and because I’m not doing Pay Per Click, I’m on page four or five for that listing. Also if I’m selling a toy I’d put in ‘toy’ and ‘toys’. 38:39 MANNY: Do you have the Amazon App, the A9 app? 38:49 KEVIN: No, I’ve never seen it. 38:50 MANNY: It’s pretty trippy. A lot of people don’t know about that. I want to talk about brands in terms of actually bidding on those – do you do anything with competitor brands’? 39:23 KEVIN: No, I’ve tested it – if you put words in there and it’s some uncommon brand it doesn’t make a difference but if it’s a major brand, it’s probably not going to work. 39:46 MANNY: So if you’re in a category where they say there’s two or three sellers who are just dominating, 1000 units a month each in sales, would you consider using their brand name? 40:10 KEVIN: What I’ve found works better is if you do a broad Pay Per Click on that for example ‘eyelash serum’, I’ll get people typing in a brand name that’s ‘Unique eye lash serum’ then Amazon won’t give me any searches as they’ve filtered it out. If I leave it as a broad match, just eyelash serum, I can pick up some of the brand stuff. 42:30 MANNY: You said you start 1000 units a time when you’re starting with a new product, is that your standard, do you always do that? 42:45 KEVIN: Yes, that’s my standard. When am looking at my product, I’m pretty confident. If you have less units, you can’t really promote it as you’re going to run out of stock soon. You spend a lot of money to get that product launched and for reviews, you can’t do that with 200 units. Another thing I do is I do inspections in China before the product is shipped to the USA to make sure everything is there that needs to be there and that the products look good. I find that after I’ve started doing the inspections, the products started looking better and I had less problems with my products. 48:29 MANNY: They’ll even do the three-foot Amazon drop test for you. 48:32 KEVIN: I have them drop the master product form three feet because when they’re being shipped, they handle them roughly and you don’t want to deliver a product that has a dent in. I also order a few extra boxes for in case this happens and for returns of products that were never used, so I can resell them then. 50:15 MANNY: For all of you who think that Kevin has all of these things going on…how many people do you have in your company? 50:30 KEVIN: It’s just me. 50:31 MANNY: Outside of hiring a couple freelancers to do your specifications and that, it’s just you? 50:39 KEVIN: I’ve got a bookkeeper coming in once a month as I don’t like doing the nitty gritty stuff. I also have some guys I get to do my packaging. I’ll sit down and do the sketches on paper and send it to them and tell them that’s what we have to create and we’ll communicate back and forth for a week. That’s all for $110. When my pallets come I’ll have someone assist me in removing the pallets and getting Amazon stickers on the boxes and shipping them to Amazon. 52:42 MANNY: You’re one of the few people I know who handles a big amount of inventory who don’t ship them directly to Amazon, you ship the stuff to your house? 52:55 KEVIN: Right now I’m working from my house but it has gotten to the point where I’ll have to get a little warehouse. On the first thousand units I put a PC barcode, not the Amazon code, for in case somebody hi-jacks the product. Now I let Amazon put that label up for me. My inspection company checks everything for me. I ship them via central freight so it costs me $150 instead of $1000 for UPS. I’ll pay that extra 20 cents for them to label it. I’d like to have that eyeball checked. 56:24 MANNY: Especially if your order comes in and it’s $80 000 worth of retail goods, a few dollars more wouldn’t make a difference. For the listeners who say that you can’t do it, you don’t have the time, this guy is doing it alone. You can do it, you just have to take that first step and do it. You can’t just keep learning forever, you’ll have to dive in. 57:00 KEVIN: I’ve been there, I’ve had companies where people worked for me out of a warehouse and I don’t want to get to that position. I cap this, I don’t want it to grow that much. My goal is to get this to $10M by 2019 and I might have to bring on one or two people. I just want to make enough money to survive and enjoy my life. 58:05MANNY: That’s cool. It’s ironic because I will ask a question and you’ll come up with five things and I’ll want to go back to each. This is so full of information. Four-color-box is the technical term for having unlimited color. Are you having your supplier do that or do you have it done and then ship it to your manufacturer? 58:44 KEVIN: I let the supplier do it. I send my designs through to them. I had them change something once and the inspector caught the problem and had them repackage the items. 59:58 MANNY: What does it cost you typically when you’re doing custom boxes? 1:00:15 KEVIN: It depends on the box – I’m not doing a fancy box. I just take their basic template and redo the artwork. It depends on the thickness of the box – sometimes it’s 10 cents, the most expensive is $2.06 and then it’s a really nice, thick box. People eat with their eyes. You have to give a good image of your brand. It adds a sub-consciousness to your product. 1:02:59 MANNY: For your main image itself, do you put your product box in that white background or in the secondary image? 1:03:12 KEVIN: On some products I do put the product box. I put the price box in the background and the product box in front of it. It helps the product to stand out when someone is going through the pages and it’s clean, without “Number one seller!” and “Best seller!” banners. You have to still have a white border around the edge of your image – without it Amazon software sometimes remove the photo. 1:04:46 MANNY: Do you use all your images; do you fill every space? 1:04:48 KEVIN: Yes, I do. I make sure they’re all 1500×1500. I don’t use any image from the factories. I create all my images and try to show my product in context so people can relate. Your second image is important as it is visible when searching. 1:07:10 MANNY: How long does it take your inspector to do an inspection? Many people believe they should get the product out right away, so if you add the inspection process, how much time does that add? 1:07:30 KEVIN: Usually I give the company 48 hours to complete the inspection but they do it in 24 hours. If my product is done on Monday, I can let the inspector know and I’ll have the report back on Wednesday. 1:08:04 MANNY: For protecting your products you use a five wall box and corner protectors. What I the costs of that and can you have all suppliers do that? 1:08:22 KEVIN: Some suppliers don’t do the five corners so I choose three corners and just ask them to but Styrofoam around it. There is an extra cost but it’s not huge – maybe $50 total for the whole shipment. 1:09:05 MANNY: Great! You typically ship these products via sea or air express? 1:09:13 KEVIN: I do both. It depends – I just had 1000 items come in and to ship them by air was going to cost me $2500 and shipping them by sea was going to be $1900 so I just had the whole thing come by air. If the container is heavy, it comes by sea. 1:10:27 MANNY: In a different conversation we were talking about pricing and how people end their products on .95 or .99, you don’t do that? 1:10:38 KEVIN: If you want to make things look more expensive, you put a period with two decimals after them. If you list your product for $39.39, it feels less than to just say $39.00. There’s a psychology and if I list cents, I will do .88 or something unusual to make it stand out. 1:11:56 MANNY: Dealing with your suppliers overseas – do you use any NDA’s or not? 1:12:06 KEVIN: You can do it but it’s just cumbersome. I don’t do it, even on the products I developed, they’re just going to knock you off. I had a product come out and it went through the trademark and everything was fine. They publish it in a little magazine and they have a certain amount of days where someone can raise an objection and there was a law firm that raised an objection to one of my marks and said it was too close to them, it wasn’t worth fighting as it was a big firm, so I changed the packaging. 1:15:36 MANNY: Nice. Maybe we can do a part two and talk about all these other things like 3D printing, tooling for your products and customize the products, how you do some cool ninja things with your Pay Per Click and what you do when inventory is running low. If you want this – tell us on our Facebook group/website. Please also head over to Periscope app and follow me – @mannycoats and get to know me, it’s not all only business. Go to AM/PM Podcast and post your questions there – go over to our Facebook group and request access, it’s called the Amazon FBA High rollers and we’d love to see you there.